Continuing with our examination of the Seven Sorrows of Mary, which are meditated in the Rosary of the Mater Dolorosa, today we discuss the Loss of the Child Jesus in the Temple. If you haven’t read my previous posts on the first two sorrows, I would encourage you to read both of them – The Prophecy of Holy Simeon and The Flight of the Holy Family into Egypt. Now his parents went to Jerusalem every year at the feast of the Passover. And when he was twelve years old, they went up according to custom; and when the feast was ended, as they were returning, the boy Jesus stayed behind in Jerusalem. His parents did not know it, but supposing him to be in the company they went a day’s journey, and they sought him among their kinsfolk and acquaintances; and when they did not find him, they returned to Jerusalem, seeking him. After three days they found him in the temple, sitting among the teachers, listening to them and asking them questions; and all who heard him were amazed at his understanding and his answers. And when they saw him they were astonished; and his mother said to him, “Son, why have you treated us so? Behold, your father and I have been looking for you anxiously.” And he said to them, “How is it that you sought me? Did you not know that I must be in my Father’s house?” And they did not understand the saying which he spoke to them. And he went down with them and came to Nazareth, and was obedient to them; and his mother kept all these things in her heart. The Loss of the Child Jesus in the Temple begins not in the Temple where it’s revealed to us in the Sacred Scriptures, but days before, since it was custom that the men of Israel were obligated through the Law to make a pilgrimage to Israel for three feasts each year. This was the feast of Unleavened Bread and the Passover. Although women and children were not indebted to attend these feasts, devout families would often travel together up to Jerusalem. Now knowing this, we can see how easily it was that Jesus had gone missing. During these pilgrimages, the city of Jerusalem would surge, and nearly double in size with the many people arriving and staying. To get from their home to Jerusalem and back again, individuals would travel in caravans and in two groups, one group of men and one group of women. Children would go with one of the two groups. When a stop was made, this was the time for families to gather together again. It was at this point when returning to Nazareth that Mary and Joseph realized that Jesus was not with them. They searched for him among the other family members, but not finding him, they returned to Jerusalem seeking the Child. You could imagine the anxiety and sorrow they must have felt as they rushed back to find Jesus. St. Luke doesn’t explain to us this journey back to Jerusalem, but focuses on the dialogue between Jesus and his Mother. As they return to the Holy City, they find Jesus in the Temple “listening to [the teachers] and asking them questions (vs. 46), and everyone that heard him were “amazed at his understanding” (vs. 47). We come to realize that Jesus isn’t just your ordinary Jewish child, or even a very clever boy, but he is the Son of God. 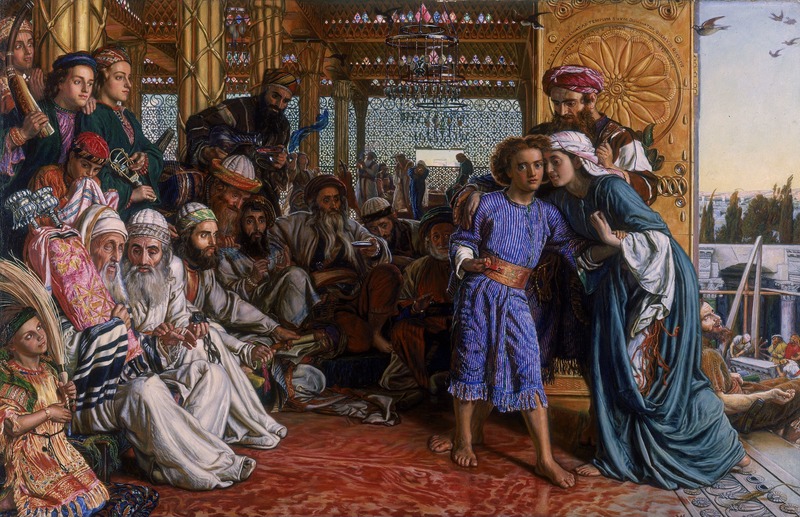 The response that Jesus gives to his mother is neither remote nor rebuking, but shows that the Semitic mind is a mind that “relishes contrasts and antithesis.” Jesus’ response is not stating that they as his parents did something incorrectly, but that the will of God is more important than their role as parents. They must learn to be subservient to the divine economy of God. His parents do have an important part to play since they will raise him. He will grow under their care and be obedient to them. So as I conclude, for this week as we continue to focus on the Seven Sorrows of Mary, let us have the intention to seek out the Lord Jesus Christ this week and embrace him wholeheartedly. May we never lose sight of His abundant love and mercy for us. Let us know that Christ leads us to the Father just as Mary leads us to Him. Ignatius Catholic Study Bible New Testament. Ignatius Press, 2010. The Navarre Bible – The New Testament Expanded Edition. Four Courts/Scepter, 2008.